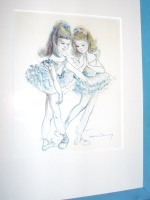 Last month I learned about a lady who had bought an original painting of two little ballerinas by my mother Brownie Downing. She contacted my sister Chele through the website we put together in her honour. The unusual thing about this is that Brownie hardly ever sold her original paintings, and as a result there are very few that remain outside the family. I was intrigued to know how it had come into her possession, and she said that she had bought it in an antique shop in Brisbane in Queensland, Australia. It was in very bad condition and she had it restored. 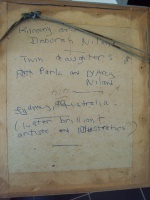 These two little girls were the daughters of D’Arcy and Ruth Niland. In the late 1950’s they lived in Balgowlah on the north shore of Sydney harbour. By coincidence we lived there too when I was very young with my own brother and sister and we would have been a little younger than them. I think it is possible that we were neighbours then and that Brownie was friends with the Niland’s. She would have painted the sketch of the girls one day and given it to them as a present. D’Arcy was an acclaimed writer by then and had published several books including his great Australian work ‘The Shiralee’ in 1955. His wife Ruth was also a successful author of several children’s books. Both of the girls went on to become famous children’s book authors and illustrators and made their on mark on the world. Sadly, there seems to be no-one left who can explain the story about the painting of the twins, or how it ended up in Brisbane. Everyone has since passed away except one of the girls, Deborah who is still living, and we are trying to get in touch with her. Please visit an aerial video of Forty Baskets Beach in Balgowlah where we once lived. Taken using a remote-controlled drone! Click here. Elise…what a beautiful story.How lucky you were to have personally known Brownie.There are many people in Australia that would have loved to say they had met her,instead we are actively collecting her beautiful works,& the rarer pieces are getting harder & harder to find.Thank you for sharing. 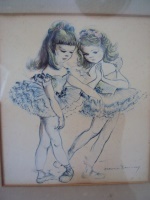 I live in Andorra and was a good friend of Brownie , she gave me two paintings of ballerinas, which I have on my wall in Spain, signed by herself ,I did not buy them,thy are in perfect condition, and I love them,she gave them to me one day when we had lunch in Pal where she lived,we used to go shopping together. What a wonderful story, we need more recollections like this one. Many thanks Wendy. Glad you enjoyed the story! Kindest wishes.